We had such an amazing time at Thursday's celebration of National Library Week! The volunteers and library patrons really came together for the festivities and events. We really couldn't be prouder of our library! In addition, we also received a Proclamation from the City Mayor, Peter Bober in honor of Library Week. 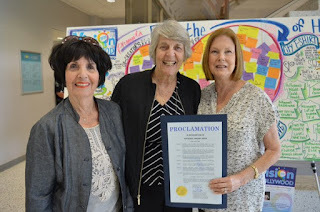 Here's a picture of three of our board members with the Proclamation. Pictured from left to right: Sylvia Blutstein, Helen Harringer and Judy Koch.